Home » Featured , Our Body » How long can a person stop his breath ! How long can a person stop his breath ! You must have tried it for fun while playing with your friend. Some people practice it to improve their underwater swimming experience while some practice it just to know how long can they stop their breath. Some people also do it to make it to Guinness World Records. We don't suggest you to practice it alone at your home as sometimes it can be really dangerous. Those who made world records used proper guidance and expert advice to do it correctly. Breathing is something that happens naturally without forcing our body to do it. But when it comes to stopping your breathing process, you need to apply force and control your urge to inhale. Aleix Segura Vendrell (Spain) holds the Guinness World Record for holding breath for 24 Minutes 03 Seconds. There are some secrets behind holding the breath for such a long duration. Underwater: You can stop your breath for longer duration under water compared to land. The duration differs by 50%. No one has yet hold his breath for more than 12 minutes on land, while the underwater record is above 24 minutes. This is due to “diving reflex". Even if an untrained diver goes inside the water, the pulse rate slows down by 30%, which means a decrease in metabolic rate of body. Professional divers can slow their pulse by 50% under the water. This diving reflex decreases the oxygen consumption of body and allows a diver to hold his/her breath for longer duration. Hyperventilation: Hyperventilation is a process of fast and deep breathing to decrease the Carbon Dioxide level in body. Those who have deeper knowledge of biology know the fact that our brain controls the urge to breathe through CO2 level (not Oxygen level). When CO2 level in brain reaches at a certain maximum level, we feel the heavy urge to breathe. Decreasing the CO2 level through hyperventilation makes a person buying some extra time to stop his/her breath, as it takes longer for CO2 level to reach the maximum level. Practice: Practice and dedication is the key to holding your breath for long duration. But you should never practice it alone without any medical help near you. Slowing down your pulse rate/metabolism by 50% takes a lot of practice. Stopping your breathing process is not something normal for your body. Your body will try to do everything to make you breathe. But if you don't then it will take some alternative measures to save your life. These alternative measures constitute of some side effects on body. Brain Damage: Lack of oxygen supply to your brain can damage certain areas in your brain. However there are different views on this side effect among the experts. Hypoxia: If you are doing hyperventilation before stopping your breathe then you might face unconsciousness due hypoxia, which is lack of oxygen in body tissues. Hyperventilation decreases CO2 level in body and it takes longer for that level to reach its maximum level, but the oxygen level in body might be exhausted before CO2 level reaches its maximum level, which can cause unconsciousness due to hypoxia. Note: Guinness World Record allows the contestant to hyperventilate with pure oxygen for 30 minutes before making an attempt to stopping breathing. 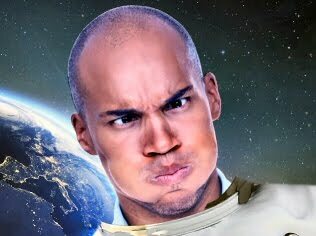 In normal air oxygen is just 21% while in pure oxygen it is 100%, which makes a person stop his breath around 2 times more than hyperventilating with normal air. So a normal person with normal air to breath with no practice of hyperventilation can never reach even the 50% time of the world record.